Coal workers pneumoconiosis, better known as CWP or black lung disease, can be defined as the accumulation of coal dust in the lungs and the tissue's reaction to its presence. 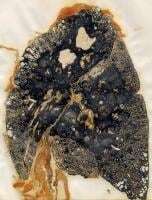 Inhaled coal dust progressively builds up in the lungs and is unable to be removed by the body; it leads to inflammation, and fibrosis, and in the worst case necrosis. CWP develops after an initial, milder form of the disease known as anthracosis, because of a prolonged exposure to a large amount of coal dust. porous nature. The Mine Safety and Health Administration (MSHA) established that the respirable coal mine dust permissible exposure limit (PEL) is 2 mg/m3, while NIOSH has recently lowered its PEL to 1 mg/m3. Inhalation of coal mine dust can lead to the development of several diseases including CWP, bronchitis, emphysema, Caplan syndrome, and silicosis. Coal miners typically develop one of two forms of disease patterns: simple CWP or complicated CWP. According to the severity of disease CWP is categorized in simple CWP ,characterized by the formation of black coal dust macules around the respiratory bronchioles, mostly in the upper lobes of the lungs. These coal macules contain aggregations of anthracotic macrophages, supported by a fine collagen network and has a surrounding area of enlargement of the airspace, known as focal emphysema. Generally SCWP is not associated to respiratory symptoms. Increased exposure to coal mine dust results in the development of nodular lesions that are firm on palpation and are formed by coal dust-laden macrophages interlaced with collagen fibers oriented in a haphazard manner and may have round, irregular, or stellate borders. Nodules may converge and coalesce and form lesions larger than 2 cm with a fibrotic nature. This condition is called complicated CWP or PMF, characterized by a decreased lung function. The prevalence of coal worker’s pneumoconiosis is related to the length and the type of exposure to coal dust and is therefore more prevalent in people exposed to higher concentrations. There are currently about 130,000 underground coal miners actively working in the United States. In the past ten years, over 10,000 American miners have died from CWP. Although this disease is preventable, many miners are still developing advanced and severe cases. A 2004 study reviewed death certificates from 1968-1982 and 1982-2000 with coal worker’s pneumoconiosis as the cause of death. A 36% decrease was noted in the reporting of male deaths due to coal worker’s pneumoconiosis from 1982-2000 compared with from 1968-1982. This overall decline is likely multifactorial, due to the decline of the coal-mining workforce in general and the institution of the Federal Coal Mine Health Safety Act. More recently, however, rates of the disease have been on the rise, especially among younger miners. The National Institute for Occupational Safety and Health (NIOSH) reported that close to 9 percent of miners with 25 years or more experience tested positive for black lung in 2005–2006, compared with 4 percent in the late 1990s. It is attributed to the increased exposure to excessive amounts of respirable crystalline silica, a small component of coal dust. The National Institute for Occupational Safety and Health, with support from the Mine Safety and Health Administration (MSHA), has started a Mobile Health Screening Program. Coal dust that enters the body can neither be removed or destroyed . The particles are engulfed by resident alveolar or interstitial macrophages and remain in the lungs, residing in the connective tissue or pulmonary lymph nodes; for this reason CWP is one of the most widespread fibrotic lung disease. Although pathophysiological mechanisms are not completely understood, there is acceptance of the concept implicating chronic inflammatory processes as the development of the pulmonary lesions. #Direct cytotoxicity of coal: coal dust can cause lysis of red blood cells and leakage of lactate dehydrogenase from alveolar macrophages, which causes cellular damage. #Activation of reactive oxygen species by alveolar macrophages: coal dust stimulates the release of proteolytic enzymes and the secretion of ROS such as superoxide anion, hydrogen peroxide and hydroxyl radical from AMs. Hyper secretion of reactive molecules in response to prolonged exposure to coal dust may overwhelm the lung's natural defense systems, i.e. antioxidants like superoxide dismutase, catalase, glutathione and anti-proteases. It leads to cell damage, as lipid peroxidation, and destruction of the lung parenchyma. Lipid per oxidation is one of the most widely used indicators of free radical formation, a key indicator of oxidative stress. Unsaturated fatty acids such as those present in cellular membranes are a common target for free radicals, because they contain multiple double bonds in between which lie methylene bridges (-CH2-) that possess especially reactive hydrogens. It is the process in which free radicals "steal" electrons from the lipids in cell membranes, resulting in cell damage. Reactions typically occur as a chain reaction. Initiation is the step in which a fatty acid radical is produced. The most notable initiators in living cells are reactive oxygen species (ROS), such as OH·, which combines with a hydrogen atom to make water and a fatty acid radical. This leaves an unpaired electron on the fatty acid radical that is then capable of capturing oxygen, so it reacts with molecular oxygen, thereby creating a peroxyl-fatty acid radical. 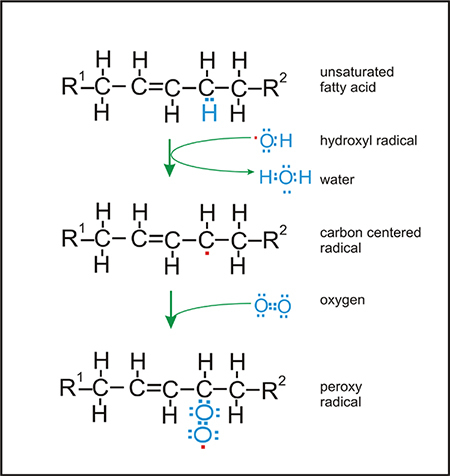 This radical is also an unstable species that reacts with another free fatty acid, producing a different fatty acid radical and a lipid peroxide. #Stimulation of the secretion of inflammatory and chemokine from alveolar macrophages and/or alveolar epithelial cells: the alveolar macrophages (AM) play a crucial role because of their ability to release mediators. When cultured in the presence of mineral particles, macrophages are able to release not only oxygen radicals and eicosanoids but also a large panel of cytokines and fibroblast growth and differentiating factors. More recently, resident cells such as alveolar epithelial cells and endothelial cells, have been shown to be effector cells themselves, secreting and expressing various molecules involved in inflammatory processes. This spontaneous cytokine release is associated with an increased cytokine messenger ribonucleic acid (mRNA) expression in the lungs of coal miners due to a hyper activation of pro-inflammatory NF-kB network. Nuclear factor kB (NF-kB) is a transcriptional regulator that plays a central part in responses to inflammatory signalling not only through Toll-like receptors, but also through TNF receptors and the IL-1 receptor. NF-kB dimers are constructed from five different gene products, all of which have a conserved region called the Rel homology region. The C-terminal domain of this region is responsible for dimerization and I-kB binding, whereas the N-terminal domain is primarily responsible for DNA binding specificity. The classical pathway of NF-kB activation is illustrated in the panel, which shows an inflammatory response operating through a heterodimer of p50 and p65. NF-kB dimers are held in the inactive state by a family of inhibitors called I-kB. Receptor signalling leads to activation of a multi-subunit I-Bk kinase (IKK) complex which phosphorylates I-kB on two key serines. Phosphorylation of I-kB marks it for degradation by the ubiquitin pathway, so that the NF-kB dimer is liberated to translocate to the nucleus, bind DNA and activate transcription. The NF-kB signalling targets are: cytokines, chemokines, adhesion molecules, COX-2 which allow the production of prostaglandins. TNF-alpha and IL-1 induce the recruitment of inflammatory cells(lymphocytes, neutrophils, eosinophils, monocytes) and macrophages from pulmonary capillaries to the air spaces. These cytokines also activate pulmonary phagocytic generation of oxidant species, leading to tissue damage. In vivo TNF-alpha induces pulmonary hyper permeability and edema. Chemotactic factors for polymorph nuclear leukocytes include interleukin-8(IL-8), leukotriene B4, platelet-activating factor (PAF). It is also known that, in the development of fibrosis following mineral dust exposure, TNF-alpha stimulate fibroblast chemo taxis or growth in vitro, either directly or by induction of growth and differentiating factors. IL-6 is important in inflammatory processes due to its ability to induce cellular adhesion molecules on monocytes, which facilitates their infiltration into the lung. It seems to be implicated in autoimmune processes in association with TNF and could also be implicated in the fibrotic response due to its ability to induce collagen synthesis in vivo. In order to establish the importance of TNF-alpha and the other cytokines in the development of CWP many studies have been made. The first study I report investigate the levels of serum interleukin-8 (IL-8) and tumor necrosis factor-alpha (TNF-α) as CWP biomarkers in 110 retired coal miners (22 controls and 88 CWP subjects) that were related to cross sectional findings and 1-year progressive changes of the pneumoconiosis. The mean serum IL-8 level was significantly higher in CWP compared to controls and IL-8 levels correlated with the degree of CWP. The median serum TNF-α level was significantly higher in subjects with progressive CWP compared to subjects without CWP progression. Serum cut off values of IL-8 and TNF-α were 11.63 pg/mL (sensitivity, 69%; specificity, 64%) and 4.52 pg/mL (sensitivity, 67%; specificity, 79%), respectively. High levels of serum IL-8 are associated with the presence of CWP and those of serum TNF-α are associated with the progression of CWP. Also BAL be used to evaluate the cytokines levels. #Stimulation of fibrogenic factor release: In addition to TNF-alpha with intrinsic capacity to promote fibroblast recruitment and replication, other macrophage-derived mediators have been proposed as major mediators in the fibrotic process. In this respect AMs exert all types of activities through their capacity to release PDGF and fibronectin, two competence factors, and alveolar macrophage-derived growth factor,a progression factor for fibroblast proliferation. Coal exposure could also trigger the generation of PGD2 and PGE2 which regulate macrophage activation and fibroblast proliferation. In addition to being a growth factor,IL-1 has also been described as a direct stimulant of collagen production by fibroblast in culture. TGF-beta acts as a mediator regulating chemotaxis and proliferation of fibrosis but at the same time may suppress inflammatory reaction. TGFβ bind to a type II receptor, which recruits and phosphorylates a type I receptor. The type I receptor then phosphorylates Smad3 which can now bind the coSMAD smad4. Smad3/Smad4 complexes accumulate in the nucleus where they act as transcription factors and participate in the regulation of target gene expression. TGF beta cause the transcription of mRNAs involved in apoptosis, extracellular matrix neogenesis and immunosuppression. Lee YC et al. showed that type II pulmonary epithelial cells respond to anthracite coal dust PSOC 867 with increased synthesis of extracellular matrix (ECM) components.Alveolar macrophages modulate this response through tumor necrosis factor-alpha (TNF-alpha) or transforming growth factor-beta1 (TGF-beta1) pathways. The effects of TNF-alpha (10 ng/ml) and/or TGF-beta1 (2 ng/ml) were investigated in dust-exposed primary type II cell cultures. In control day 1 or day 3 cultures, TNF-alpha and/or TGF-beta1 had little or no effect on the synthesis of type II cellular proteins, independent of whether the cells were exposed to dust. With PSOC 867 exposure, where ECM protein synthesis is elevated, TNF-alpha and TGF-beta1 further increased both the absolute and relative rates of ECM synthesis on day 3 but had little effect on day 1. Each mediator increased expression of fibronectin mRNA, as well as of ECM fibronectin content. Therefore TNF-alpha and TGF-beta1 modulate both ECM synthesis and fibronectin content in coal dust-exposed type II cell cultures. In order to determinate the capacities of AMs, exposed in vivo to mineral dust, to modulate fibroblast growth, the secretion of these three mediators has been analysed in a population of patients with CWP. They were detected at higher levels in the epithelial lining fluid (ELF) of those patients. The levels were different according to the degree of severity of the disease. PDGF and IGF-1 concentrations were elevated in ELF of patients with PMF, while TGF-beta was found to predominate in ELF recovered from patients with SP. In 1980, the International Labour Office (ILO) created standard radiographs that allowed for accurate diagnoses of pneumoconiosis and other interstitial lung diseases. The chest radiography is a relatively insensitive and nonspecific tool for diagnosing pneumoconiosis, because silicosis and CWP are virtually indistinguishable on radiologic studies. Consequently, without the proper history, occupational lung disease cannot be diagnosed on the basis of radiologic findings. Even so, the ease of performing the study, combined with its cost-efficiency, makes radiography almost indispensable. CT is more sensitive and specific than chest radiography; CT can depict nodules that chest radiography cannot, although HRCT is best for detecting nodules smaller than 3 mm. The major problem linked to CT and HRCT is the lack of standardization of technique and scoring. This chest X-ray shows coal workers pneumoconiosis - stage II. There are diffuse, small (2 to 4 mm each), light areas throughout both lungs. In the right upper lung (seen on the left side of the picture), there is a light area (measuring approximately 2 cm by 4 cm) with poorly defined borders, representing coalescence (merging together) of previously distinct light areas. This picture shows complicated coal workers pneumoconiosis. There are diffuse, massive light areas that run together in the upper and middle parts of both lungs. These are superimposed on a background of small and poorly distinguishable light areas that are diffuse and located in both lungs. Treatment for both simple coal worker’s pneumoconiosis and complicated coal worker’s pneumoconiosis is symptomatic. Use oxygen as hypoxemia demands. No evidence supports the hypothesis that removing the miner from the mining environment arrests the disease once progression to progressive massive fibrosis has begun. Therefore it's opportune monitoring the chest radiographs of miners in order to prevent the development of complicated coal worker’s pneumoconiosis. While there is no cure for black lung, it is a preventable disease. Reducing the amount of coal dust and silica in the air that miners breathe and reducing the length of time that miners breathe the dust is the only way to prevent it. 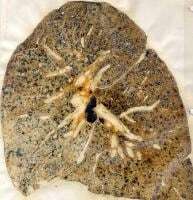 Caplan syndrome is a nodular condition of the lung occurring in coal dust-exposed persons with circulating rheumatoid factor. The nodules in the lung typically occur bilaterally and peripherally, on a background of simple CWP. There are usually multiple nodules, varying in size from 0.5 to 5.0 cm. They may grow or disappear and then reappear. They can cavitate, calcify, or develop air-fluid levels. Macroscopically the nodules are pale yellow with a central necrotic zone composed by elastin, collagen and fragments of nuclear material, and with a peripheral zone with lymphocytes, plasma and macrophages which contains coal dust.